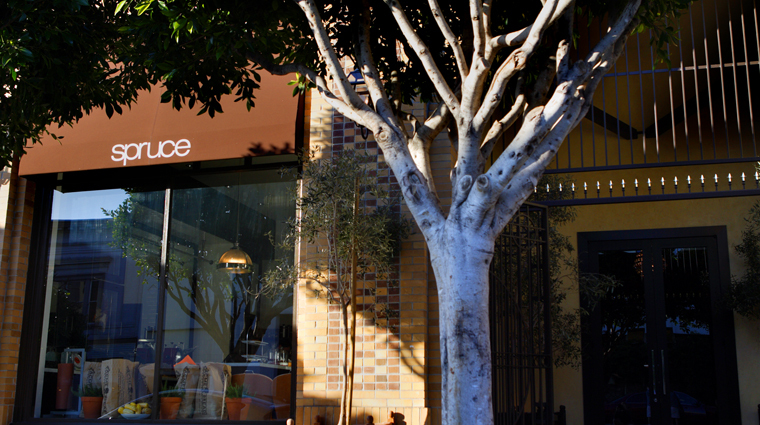 Hidden away in the tree-lined Laurel Heights neighborhood at 3640 Sacramento St. (between Locust and Spruce streets), Spruce is a contemporary American restaurant in San Francisco. 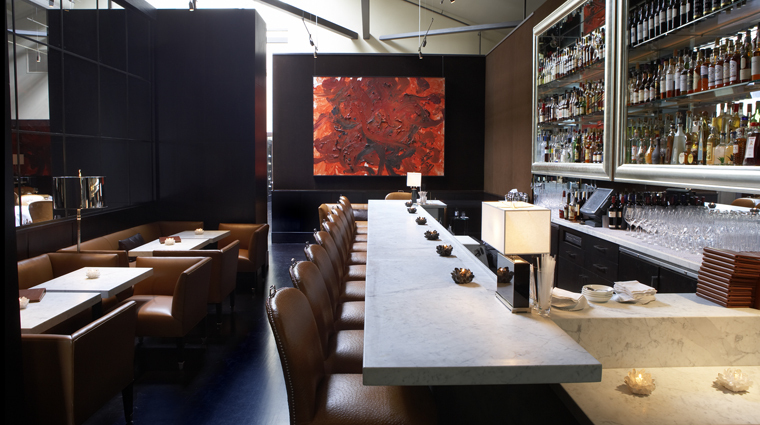 Located in a revamped 1930s auto barn, the restaurant features a saucy black décor, overstuffed leather seats, an imposing backlit bar and a glowing wine cabinet. Over all, it feels like – and is – an updated steakhouse. The main room appears enormous thanks to soaring ceilings and skylights that bathe the bar and dining area with light. A marble bar with mirrored shelves provides a low-key spot to kick back with a cocktail or burger. On the menu, the dry martini has been replaced by fancier quaffs, and the American-forcused cuisine boasts far more than beef. In fact, the food can be downright delicious (caramelized scallops with provençal vegetables; duck-fat-fried potatoes), but the kitchen and service suffer from unevenness. 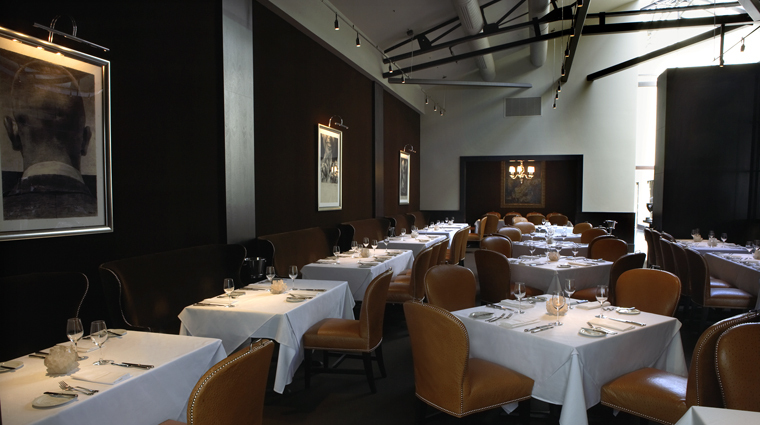 On the menu you will find chef Mark Sullivan’s hyper-seasonal, California-inspired cuisine. This includes dishes such as Early Girl tomato soup with parmesan croutons; Japanese kanpachi with cashew puree; spiced 38 North duck breast with marble potatoes and figs and a 14-day aged steak with pommes paillasson. Around 80-percent of the restaurant’s produce comes from a private, five-acre farm called SMIP Ranch, located in the hills above Woodside. Come for the scene and the staggering wine list, which is so amazing that there’s a page for each vinification of a single grape from a single country (for example, riesling and Germany). There’s a small shop with take-away gourmet goodies on one side of the restaurant. The 70-seat dining room is done up in chocolate, cream and tan tones. If it feels like you’re sitting inside a Williams-Sonoma Home catalog, you’re not far off; the brand custom-designed the furniture for Spruce. Spruce is open for lunch Monday through Friday, from 11:30 a.m. to 2:30 p.m. Dinner is served Sunday through Thursday from 5 p.m. to 10 p.m., but on Friday and Saturday the restaurant stays open until 11 p.m. Spruce is great for lunch, if you’re willing to travel to the sleepy neighborhood, shell out $14 for a tasty burger, and avoid a third glass of wine, should you have things to do later in the day.